Drinking water is often treated with a rapid sand filter. 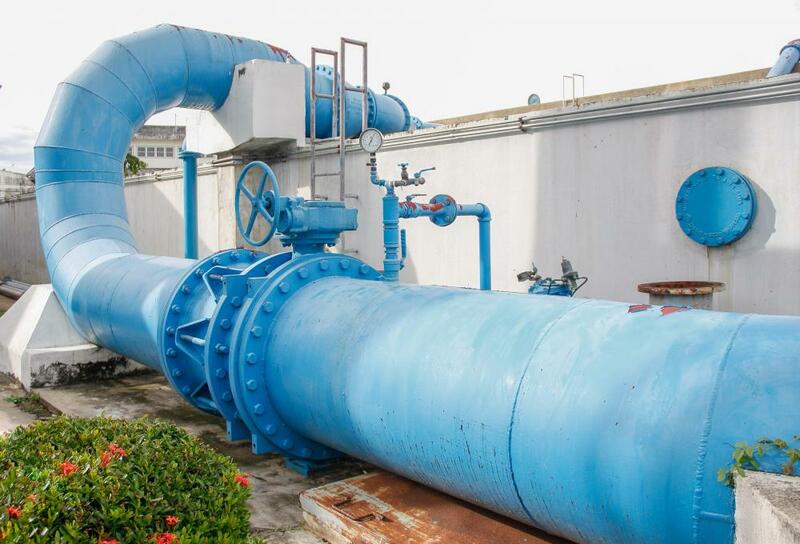 Many municipal water treatment plants process millions of gallons of wastewater each day, and then pipe it back to users or release it into the environment. A rapid sand filter is a water treatment device that uses sand or other grainy media to filter out the solid particles suspended in water. These suspended solids include dirt and other organic matter that cause water to appear cloudy or turbid. Rapid sand filtration is commonly used by municipal water treatment plants to clean surface and ground water intended for drinking water. It is also used to treat sewage and industrial wastewater containing biological contaminants before these waters are discharged to the environment. Rapid sand filtration takes place in a tank containing one or more layers of grainy media, such as sand, anthracite or hard coal, garnet, magnetite, or other minerals. The total media depth typically ranges from 2-6 feet (about 0.6-1.8 meters). In many systems the incoming water, or influent, enters near the top of the tank and flows downward through the media. The outgoing water, or effluent, leaves through a drainage system called the underdrain that lies underneath the filter media bed. As the influent travels through the rapid sand filter, many of the water-borne suspended solids become trapped above or within the pores between grains. This straining process is the primary mechanism by which solids are removed from the water. In addition, suspended solids are adsorbed onto the surface of the grains due to intermolecular attractive forces. Other physical, chemical, and biological processes also enhance solids removal during filtration. The effectiveness of a rapid sand filter is highly dependent on the characteristics of the influent and the grainy media. Important influent properties include the concentrations, types, and particle charges of the suspended solids in the water. The depth of the media bed and the particle charges, sizes, and shapes of the grains are also crucial. Smooth round grains crowd closely together and create very small pores. More jagged grains may produce larger pores, but are better at snagging solids as they pass by. Typically, layers of different grains are used to take advantage of multiple removal mechanisms. Over time, the media bed of a rapid sand filter becomes clogged with accumulated solids. At this point, the filter is cleaned through a process called backwashing. Wash water is pumped upward through the bed to dislodge the solids and rinse them out of the tank. As the wash water is drained, the granular media settle back into their original layers, and the filter is ready to be used again. What is a Sand Screen?